Matt Donders – Nerd, photographer, husband, & dad. Today, I finally uploaded the code that runs @NJDevilsGameBot to my Github account. A few years back, when I got my first Raspberry Pi and learned that the NHL had an API (although no official documentation exists, the current community driven documentation can be found here), I decided to pick up the basics of Python and build something. I ended up putting together a python script that would use the NHL API schedule endpoint to watch for changes in score of New Jersey Devils games and then trigger red beacon lights and the goal song through my receiver. The code was messy and the setup was too unique so I never published it anywhere. A few weeks ago I decided I want to take some of the foundations built in the aforementioned code, advance my Python skills a bit and Hockey Twitter Bot was born. At its core, the bot is a python script that parses the NHL Schedule & Live Feed API endpoints to gather relevant game events and tweet them to the game bot Twitter account. Some more information (such as events that are parsed and tweeted) and other technical details can be found in the README of the Github repository. The code is very much a work in progress and considering my Python skills are far mediocre at best, the code will always be. To be honest, the only reason I put the code onto Github is because I am hoping that people that are more proficient in Python than me find it and send me pull requests to fix bugs, remove redundant code or just tell me what I am doing wrong and how it can be better. I have embedded some sample tweets at the bottom of the post as well just to showcase some sample functionality. PS – if you are a Devils fan & are not following @NJDevilsGameBot – why not? The 2nd period of #NJDvsPHI comes to an end. I posted my first Weekly Links Recap a few days ago as a way to share some interesting articles I’ve come across during the week that I may not have had time or enough opinion on to give their own blog post. When I first had this idea it seemed like a lot of work to find the link, grab the excerpt (or provide my own blurb), put it into a draft post in my blog and remember to always post on Fridays – I figured that sooner or later I might find the effort not worth the reward. As a nerd, programmer and loyal iOS Workflow user I knew there had to be a better way to accomplish this & I was right! To give a bit of background, before I owned an iPhone, I was a loyal Android of almost 7 years and I had automated a lot of daily activities using Tasker, a phenomenal app that let you perform a set of tasks based on triggers or contexts. When I found out about Workflow on iOS, it was an instant purchase and it definitely has more than $4.99 worth of functionality. Due to the nature of iOS it is not as powerful as Tasker, but what it is able to do still boggles the mind. 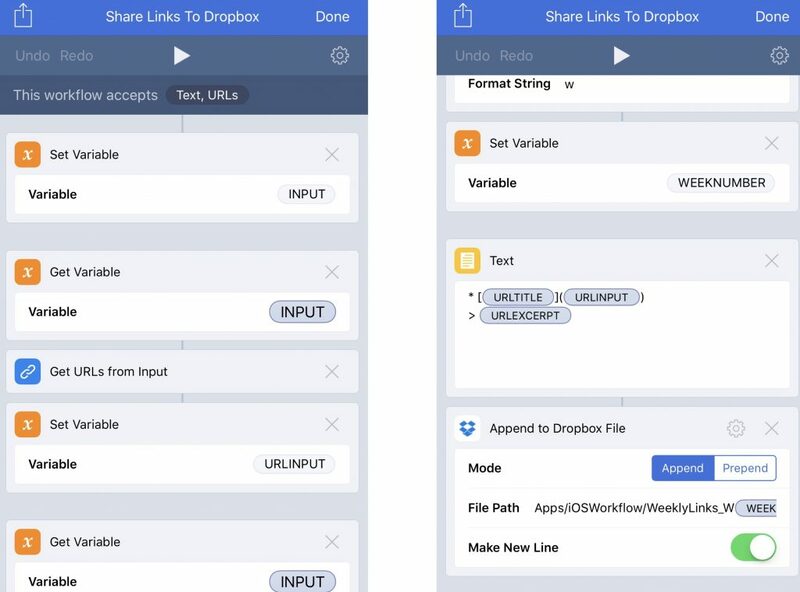 A sample screenshot of my “Share Links to Dropbox” Workflow. When a workflow accepts both Text & URL, if no text is elected the Get Text from Input also returns the URL. This allows me to enter my own excerpt / blurb. That may seem like a lot of steps, but it covers all use cases for sharing. If I want use what Workflow assumes to be the excerpt of the article I can do so, if I want to select another part of the article to be the excerpt I can do that, or if I want to supply my own custom blurb I can do that as well. Instead of having to remember to run the Workflow at 7AM on Friday mornings, I setup a Launch Center Pro notification action that allows me to automatically run that workflow from a notification I receive at that time. Once I am fully awake for the day and have some downtime at, I will do a quick proofread of the post and publish it to my blog. I am sure that my workflows are by no means perfect, but so far they get the job done and probably save me a lot of time and headache. This time savings and versatility will allow me to keep this series of weekly recaps going without any hassle. I recently started looking around at what I needed to create a podcast. Besides coming up with a good title and concept, I knew that I wanted it to sound half as good as a lot of the podcasts I listen to (see Relay.FM, ATP, etc). Besides getting a decent microphone and understanding the basics of good microphone technique, I knew I needed to understand some of the audio processing steps that took a podcast from good to great. A quick search on Google & by no surprise Jason Snell (of the wonderful Six Colors) has a great post on simple ways to use Garage Band to do just this. Jason points out that although a lot of podcast editors may use Logic or expensive Digital Audio Workstations to make their podcasts sound like they were recorded in professional studios, a lot of what is needed to make a podcast sound better than most can be accomplished in GarageBand. I have created the presets discussed in the article and even recording directly into my MacBook Pro’s built-in microphone I notice a significant difference in sound quality. With all that said I will be starting my own podcast so be on the lookout for that soon! On the latest episode of the Accidental Tech Podcast (ATP), there is good discussion around what constitutes screen time for kids and how each of the hosts handles it with their children. Marco mentions and makes a good point that with the ever increasing amount of screens that kids are growing up around it’s hard to avoid them completely, but all three guys agree that screens are fine in moderation, but it totally depends on what is being done on those screens (video games, reading, productive work / writing, etc). Ross is almost 7 months old and he only gets to “watch” TV / YouTube for a small amount of time once and a while, but mainly because he thoroughly enjoys Elmo (especially with Adam Sandler) and simple songs, which hopefully help him to learn some new words in the process. There is no standards or best practices for parenting and everyone has different views on how much “screen time” their kids should or shouldn’t have. Do what you feel is best for you & your children, but don’t automatically shun others based on their views because it may be what works for them and their family. Ross just passed the 6-month mark and with us moving into a new house this post by Casey has been super helpful in helping us build a list of things Ross needs & would probably love. Also, I had no idea those magnetic locks were a thing and they are so neat! PS – isn’t his son Declan adorable? I occasionally listen to This American Life – it is probably one of the first things people think when they hear the word podcast, and this article over at Lifehacker is such a good read. Not only is there great work methodology, there is some humor in there as well. I’d be lost without a toilet to dispose of human waste.